The tentacles of internet are spinning a vortex of rapid change and development and I feel like the world is plunging into a bland mono-culture. The world becomes smaller and the lure of Western ways take a stronghold. As I ride, I often feel like I am ploughing through mountains of plastic in Asia, catching remnants of ancient cultures. Traditional practices such as weaving, bamboo craft and religious rituals are being lost as young people leave their homelands for an outside education. Bulk loads of western t-shirts make their way to villages and sport sayings like, “ I love my computer because all my friends live in it”. The irony of this situation is lost on people who don’t speak English and don’t own a computer let alone understand the humour of their apparel. They are choosing these cheap Chinese made clothes over traditional clothes. However, we found a place which fortunately its own country nearly forgot! Sitting silently along the border of Tibet, Myanmar and Bhutan and on a road to nowhere is Arunachal Pradesh, one of India’s Seven Sister States.There are no through routes to the other countries and only barter border crossings for the local people who live in this remote region. In 1962, China marched across the border and in an attempt to stake its claim, reminded India of Arunachal Pradesh’s existence. A small group of locals fought off the Chinese and not longer after, an entry permit system was introduced for both foreigners and Indian nationals. Parts of this state are still disputed territory which India, Tibet and China lay claim to. The borders are now well protected by the Indo-Tibet military forces and gaining entry requires patience. Missed opportunities often come in the form of adversity; bureaucracy, remoteness, bad roads and monsoonal rains. For me, life is often about the road not taken. This is the one road I was determined to take. Riding motorcycles in the monsoons of The Sister States could be madness. But it would be madness to be so close to Arunuchal Pradesh and not venture into the beautiful virginal forests to see first hand some of its unique social groups. 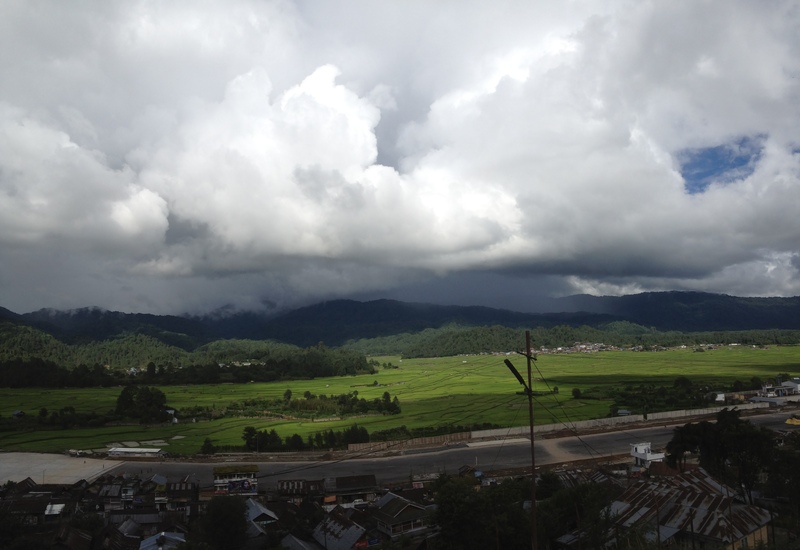 We chose Ziro Valley as our destination. But first officialdom, permits, downpours, mud, sand quagmires and landslides. Finally though, the last section of road possessed more ‘good’ than horrendous sections and we made it to Ziro. 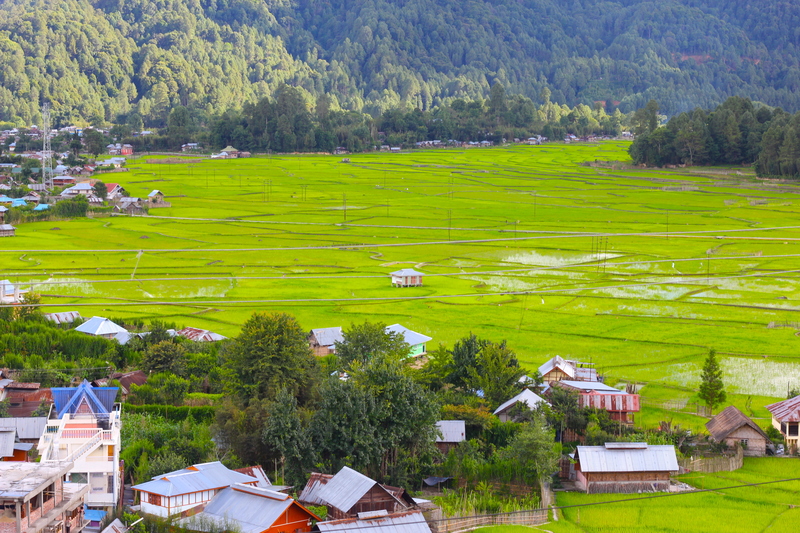 Ziro Valley has come to the attention of UNESCO for its unique cultural and agricultural practices and so we were eager to employ a local guide to help unravel the mysteries of this valley. Koj’s tour was invaluable. He opened the door of locals to us in a way we never imagined. A 7 km trip to two villages turned into a day of socialising, laughing, rice wine drinking and the opening of a small window into the traditional lives of the Apatani people. Oh did I mention laughing? We managed to laugh our way through the day with these warm, welcoming people of the Hong and Hari villages of the Ziro Valley. 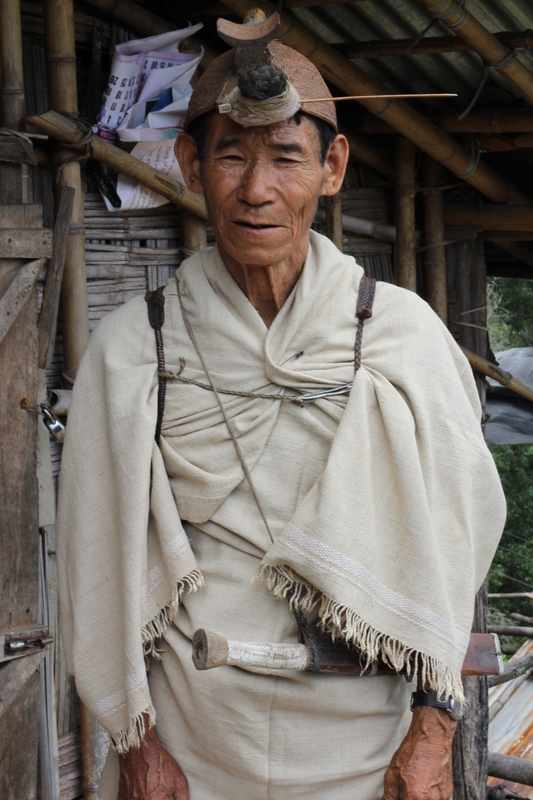 The Apatani people are one of 26 major and over 100 sub tribes of Arunachal Pradesh. Each tribe has its own distinct traditions and customs. The majority of these tribes worship the sun and moon and are animists. Their religion is known as Donyi-Polo – literally Sun and Moon. The village walk was an unfolding of some of the traditions and rituals of the Apatani. 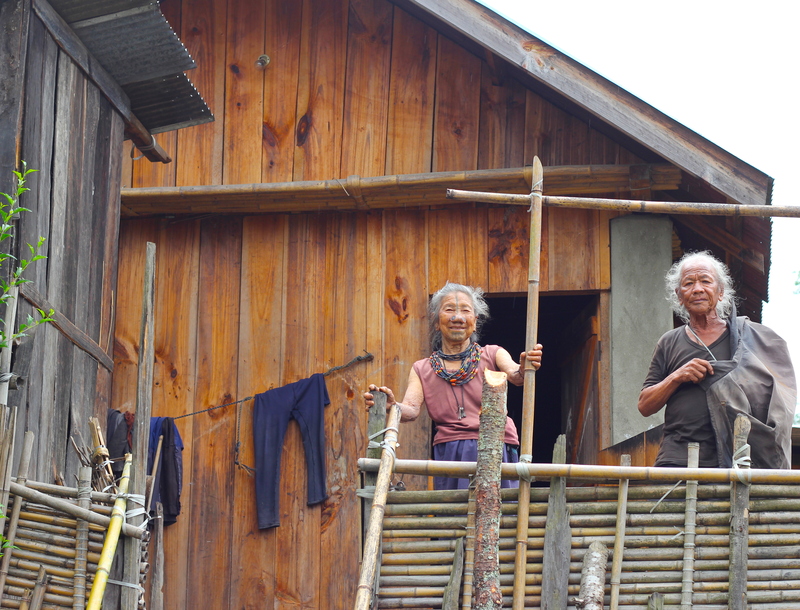 Each bamboo house has X shaped markings and bamboo structures guarding against evil spirits. Tall swaying structures signify the coming of age of the boys of the house. A similar structure in the community centre is, each year, raised by groups of men to celebrate the boys of the village becoming men. 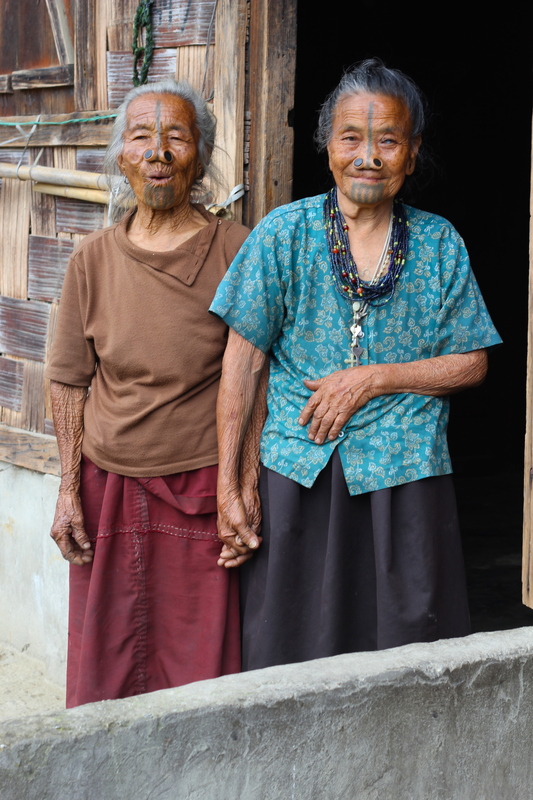 Visually, the Apatani women are identified by facial tattoos and nose plugs of indigo blue bamboo. The tattoos, according to Koj have their roots in early mythology. 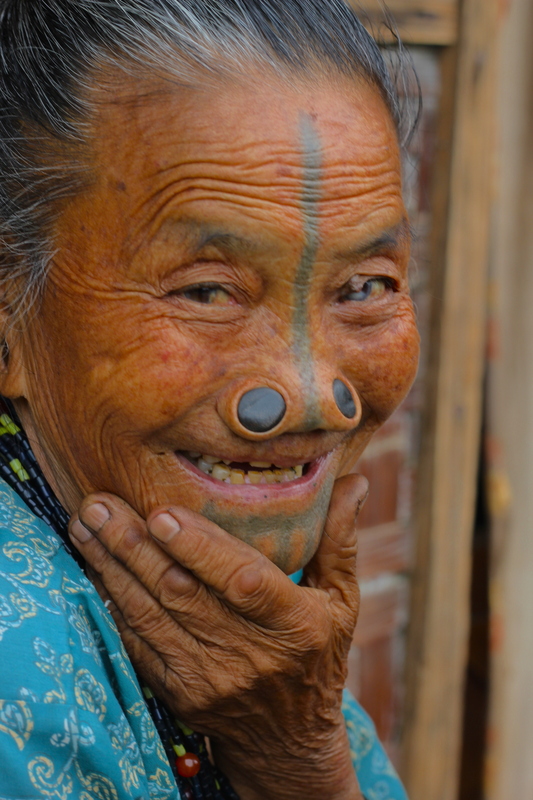 The first man and woman on earth were Apatani and the first of the three wives had these nose plugs and tattoos. (They are still legally polygamous if they so choose.) The practice did not begin, as we had read, to make their beautiful women ugly so to dissuade their kidnapping by neighbouring tribes. (I am fast becoming anti-Lonely Planet!) Koj was very clear that the facial adornments are for beauty. My awe of the facial decorations of the women soon faded as we strolled through the first village of bamboo and wooden houses. I saw two very diminutive, weathered looking older women sitting on their shared little fence between houses. Koj ased if I could take their photo and they were at first quite shy. However, after seeing their own images, they laughed and warmed to the process. Very soon, I had a very noisy, sloppy kiss planted on my cheek, with both of them laughing out loud. We then took photos of our hands intertwined , my Laos jewellery on their wrists and many different poses. They directed and I directed, all the while laughing at the differences in our skin texture and colour, our height differences and the gargantuan size of Con’s hands. We were just having fun. Upon leaving I received another noisy, sloppy kiss on the cheek. Walking further, another chance meeting with a woman in her vegetable garden turned into an invitation inside to sample home made rice/millet wine. The man of the house paraded in his handmade bamboo backpack and hat. He undid his traditional forehead hair knot and laughed at his hair springing out, pretending to scare us with his image. Again we laughed and shared a moment without speaking any common language. Farewell after a lovely time of rice wine and many laughs. After our village visit we drove by the rice fields. The rice paddy cultivation is one of the important aspects of Ziro which has lead to immense interest from sociologists and agri experts. 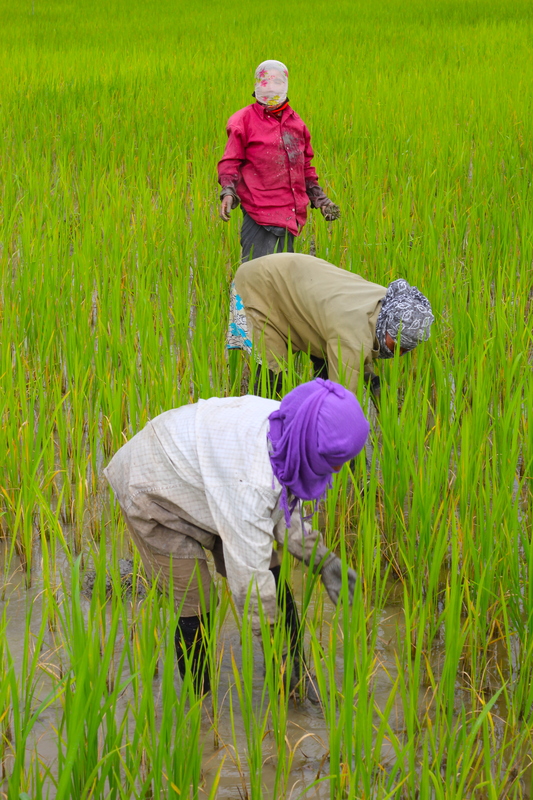 Traditionally, the villagers manage the paddies for not only rice production without pesticide use, but also vegetable production and aquaculture. No arable land is unused. Millet, herbs and other edibles are grown on the raised beds between the rice fields. Nursery rice fields are found all over the village as well as in the paddy fields. Indigenous fish are raised in the paddies and very large tadpoles caught for eating. They have no need for pesticides as evidenced by the colourful array of bent over women meticulously weeding the fields. Looking across the landscape there are so many shades of green beyond imagination. The productive, fertile valley is a wetland against the backdrop of primary forests which also have been managed for sustainability. We pass groups of young men heading into the forests in search of insects for their consumption as well as for selling. The women in the paddies, at the end of the day, take-home large buckets of huge tadpoles to be cleaned and cooked. I marvel at the willingness of these people to invite us into their homes and at how rare it is to find villages where the traditional culture is so evident and strong. 130 kms away from a main town centre and we felt like we were in a different country. This was not India. The next day we drove into the mountains to visit to a Nyishi village. These people do not harvest the wetland, but plant in the hillsides. 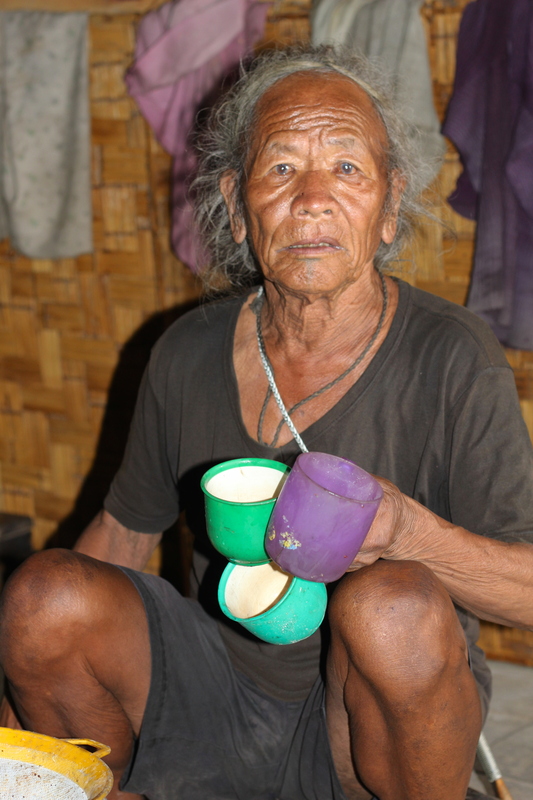 They live in longhouses with extended families and they too live a life of subsistence. 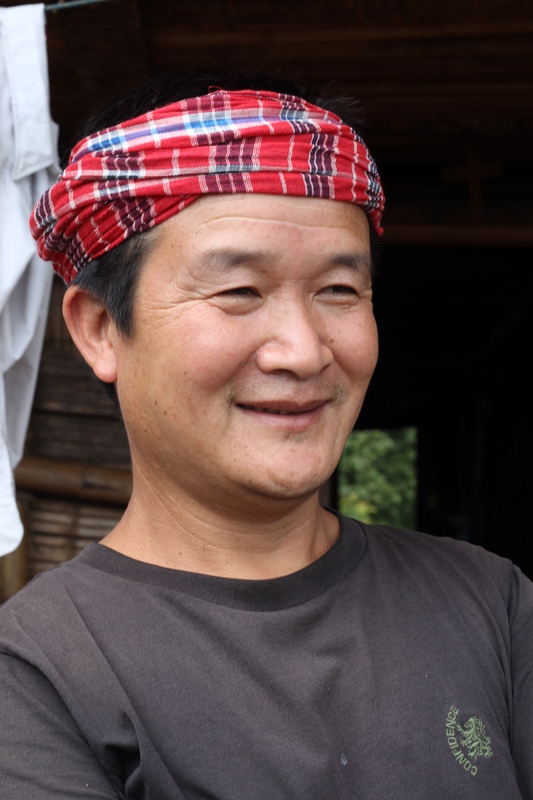 A distinctive feature of their traditional dress is the Hornbill hat worn by the men. Traditionally the woven hats had a hornbill beak and feather giving it a distinctive shape. Today though the hornbills are either wooden or plastic. They are still very distinctive! Once again, we strolled into people’s houses for a cup of tea and a display of traditional artefacts. This village was virtually deserted as most people were out in the fields working. Nyishi village. People live in long houses of extended families. Scientists and archaeologists are beginning to make discoveries in this region and are aware of the need to protect this unique social and environmental landscape. It is an exemplar of sustainable, chemical free agricultural production and is surrounded by primary forests which are still home to the snow leopard and other cats as well as an array of undiscovered species of insects. However, things are changing. Young people no longer embrace the facial tattooing nor nasal plugs and the Youth Association had it banned in 1972. 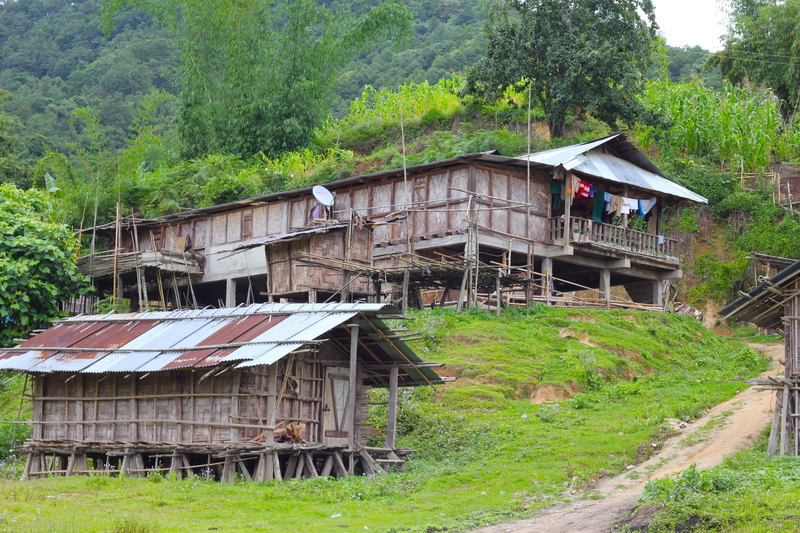 They leave the villages for further education and return with aspirations for a different life. Many of them understand the importance of retaining their culture and they walk the tightrope of balancing the old and modern. There is evidence of improving road conditions and an airport is being built. Educational institutions are in abundance in the valley and education for girls is being subsidised by the National Government. The unmaintained and dismal road conditions, monsoonal rains and the bureaucracy of gaining a permit challenged us to visit this unique part of the world. Views were clouded in mist most of the day and we were sodden throughout. Our piece of sunshine we found in the people of Arunachal Pradesh and my hope for the future of our planet was restored. We ploughed through mud, not rubbish, and found a place of hope and beauty. Fantastic Liz! Love the photos. This sounds incredible. I’m so pleased I met you both. All the best in your continuing journey. This sounds amazing! Thanks for sharing it with me. Thanks Tammy. It is certainly a unique place. Still snow leopards and other animals in the wild as well. 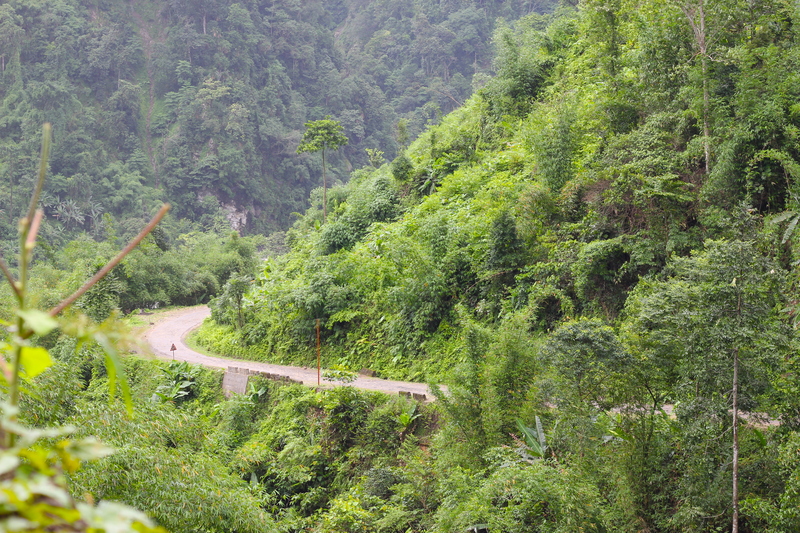 ← A situation in Nagaland – a motorcycling diary.